We’ve talked a lot recently about how oil prices are now above $70/barrel in the United States. That’s up over 150% from the lows back in early 2016. The cause of this uptick has been a “perfect storm” type scenario for oil investors. The supply of oil is low due in most part to OPEC’s policy restricting production, while the demand for oil is still extremely high, due in most part to the booming world economy that now relies on more oil to continue churning. Up until this point I’ve only talked about oil prices in the U.S., but have you noticed how oil prices abroad are looking? Brent crude, which serves as a major benchmark for global oil prices, is now above $78/barrel. That’s the widest spread between U.S. oil (measured by WTI crude) and Brent crude that we’ve seen since U.S. lawmakers permitted the export of U.S. crude in 2015. This divergence shows just how stretched global oil prices really are! Even with U.S. drillers producing a record 10.7 million barrels/day, we still can’t produce enough to change the supply and demand fundamentals in the global oil market. And that great news for U.S. pipeline companies! The difference between U.S. and global oil prices is a key factor in determining whether it is worthwhile to ship oil abroad or sell it domestically. A wider price spread makes longer, more costly journeys to markets abroad more profitable. And with the current spread being the largest in three years, oil producers cannot get their product to the coasts fast enough! 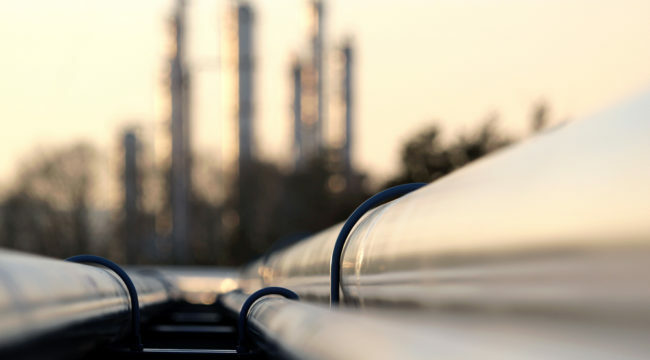 That’s great news for pipeline companies like Kinder Morgan (KMI), Energy Transfer Partners (ETP) and The Williams Companies (WMB), whose pipelines will be working around the clock (and charging higher prices) to meet the growing demand. And the best part, these companies currently pay great dividends to income investors like us that should only grow as profits increase. The “Great American Oil Boom” is underway and these companies are great “pickaxe and shovel” investments to take advantage of this emerging trend. Be sure to stick with The Daily Edge over the next few days as we continue to outline stocks set to benefit the most! Trade War On Hold — On Sunday, Treasury Secretary Steven Mnuchin stated “Right now, we have agreed to put the tariffs on hold while we execute the framework,” after the U.S. and China released a joint statement following trade talks in Washington. For now, the temporary cease-fire is a welcomed development by investors as stocks opened sharply higher this morning. However, details are scarce and markets can surely rebound if the world’s two largest economies fail to deliver on these vague comments. How’s The Housing Market? — It’s no secret that we here at The Daily Edge have been bullish on today’s housing market — and we still are! That’s because there is currently a low supply of houses for sale that’s simply unable to satisfy the growing demand. This week we’ll get the newest updates on the state of the market. On Wednesday, the Census Bureau will release new home sales figures, and on Thursday, the National Association of Realtors will report sales of existing homes. Fed Minutes On Deck — On Wednesday, the Fed is scheduled to release the minutes from its most recent Open Market Committee meeting that ended on May 2nd. During the meeting, members decided to keep rates unchanged, but as usual, this release will give valuable insights into future Fed moves. The E.U. Takes On Privacy — This Friday, May 25, the world’s strictest privacy regulations will go into effect in the European Union. This comes in the wake of Facebook’s scandal where data from millions of user profiles was mishandled by a third party consulting firm. In short, the new regulations place restrictions on companies harvesting data on more than 500 million people, while also requiring organizations to ask permission from users before collecting any personal data. Violators could face steep fines of up to 4% of global revenue for noncompliance. Zuckerberg Faces More Lawmakers — On Tuesday, Facebook CEO Mark Zuckerberg will be in Brussels answering questions relating to the Facebook data scandal that we talked about above. Questions are expected to be along the same lines that U.S. lawmakers asked in their April hearing. For those interested, the once thought to be private meeting is now set to be live streamed.